Exotek Front Bulkhead for the Associated B44.3 « Big Squid RC – RC Car and Truck News, Reviews, Videos, and More! Years ago 4wd 1/10th buggies had a terrible reputation for breakage. Back in those days even the slighest tap to a pipe usually resulted in a broken part and a DNF. The new age of 4wd buggies are different, they can take harder hits without snapping a part, but like every other vehicle out there, they do have their weak spots. 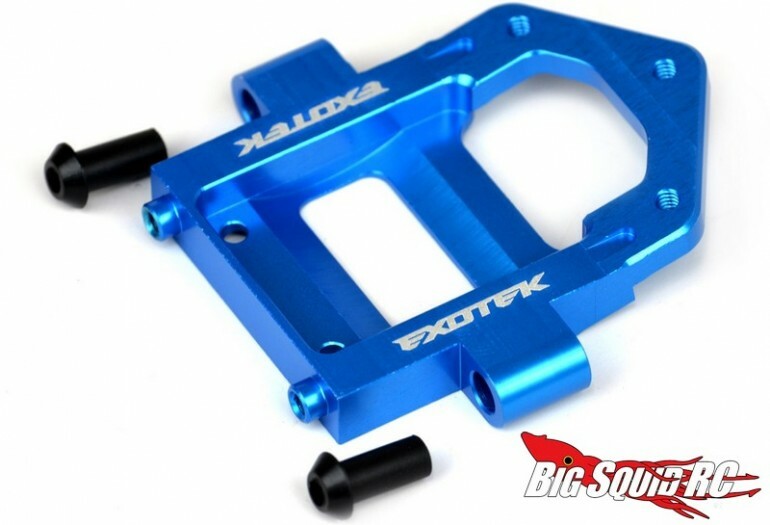 To make the Associated B44.3 tougher than ever the crew at Exotek Racing has designed an aluminum front bulkhead. Machined from tough 7075 aluminum, it is tougher than the stock piece and comes with 2 rubber bushings to help keep the front arms from breaking. And that’s not all, they are available in two different colors, black or blue, to add some bling to your buggy. The street price for the bulkhead is $20 and it has a part number of #1476. Want more details? Is so, check out This Link over on Exotek’s website. You can find more Exotek news Right Here on BigSquidRC.